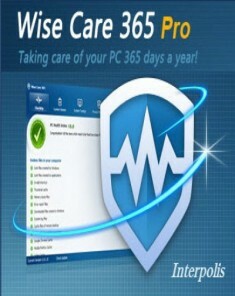 �Wise Care 365 is an all-in-one PC tune-up utility. It will keep your Windows secure, clean and fast. Wise Care 365 is a full collection of Wise Disk Cleaner and Wise Registry Cleaner. However, with other attractive and exciting features, it is far more than that. Wise Care 365 will keep your PC in tiptop shape and at peak performance! What you need to do is just one click when you use Wise Care 365. And your old PC will turn into a brand new and blazing fast one after Wise Care 365′s automatic cleanup and tuneup. Wise Care 365 can detect more hidden invalid registry issues than CCleaner, which is accredited by Gizmos and PCWorld. The scanning speed of Wise Care 365 is twice as fast as CCleaner, not to mention Advanced System Care Pro 6. �Os:Windows XP, 2003, 2008, Vista, Windows 7, Windows 8 (both 32-bit and 64-bit).